Last Monday Nick and I implemented some big changes here. We’d noticed a few things about the boys and about ourselves and decided a change would be good. The things we had noticed? Well, Nick and I were relying too much on time outs and they really weren’t doing much good lately. 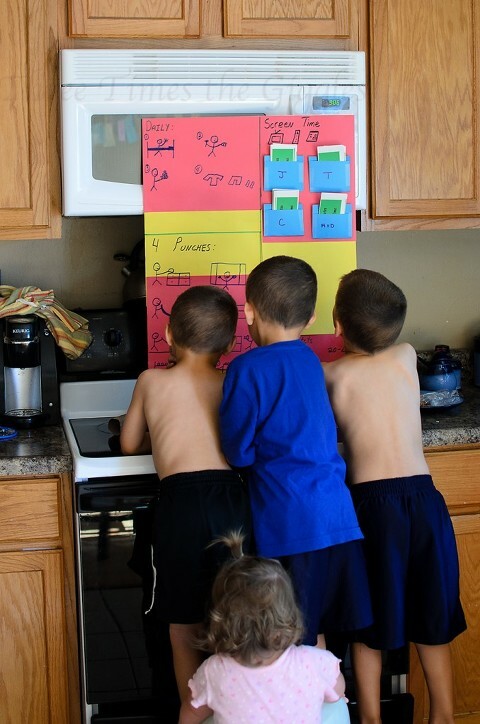 The boys would come barreling out of their rooms even more irritated then when they went in to begin with, and so began a vicious cycle… On the boys’ side of things, they didn’t seem to care as much about earning stars for their Star Charts. 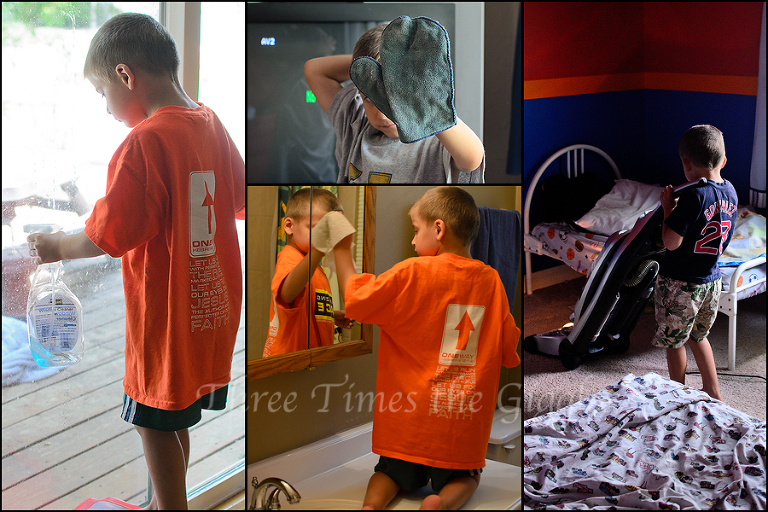 For nearly 2 years those charts have been great at curbing behavior issues, encouraging good behavior and encouraging helping out around the house. The last couple of months it went downhill though, and most weeks Ty and Jackson hadn’t earned the once coveted 30 stars. They just didn’t care. As a result, they didn’t care about acting up in public, or helping to pick up at night, or taking care of their dishes, or making their beds, or how many time outs they had. When we decided it was time to change things up, I knew we had to go big! The plan we unveiled to the boys last Monday covers a lot of different areas, so I’m going to break them down into several parts. Watch this week for parts 2 and 3 (I don’t think I’ll need a part 4). At almost 5 years old, money is starting to mean something to the boys. A few weeks ago I was telling them what an allowance is and you should have seen the way their little eyes lit up! Well now they sort of get an allowance (but we’re not calling it that), but they have to really work for it. Behold, the chore punch card! There are 10 circles to punch on the card, and once all 10 have been punched the card can be exchanged for $2. A maximum of 2 punches can be earned per day, so the fastest they can cash in is 5 days, but we knew our kids weren’t likely going to pull that off (and we were right). Nick created a big chart to hang on the wall, and it’s full of Nick-inspired drawings (as were the star charts we used to use). On the chart are the jobs the boys can pick from to earn a punch. Not all of them are jobs that need to be done every day, so the boys understand that we’re allowed to say “no” to a job request. Some jobs are obviously more simple than others, and some are also deemed as more fun than others (vacuuming and dusting are big hits). Some of them have required a bit of guidance the first couple of times, but the boys are catching on fast! I’ve done a fair amount of mixing praise with instruction (especially when it comes to telling them to slow down because they have to do it right and not just rush through to get the punch). Sweeping has been a tough one for them to master, and the dishes look a little precarious after they empty the dishwasher, but it’s meaning less work for Nick and me at the end of the day and the boys are learning valuable skills! I hope to marry off 3 boys who are as awesome at housework as Nick is! So after a full week of having the chore punch cards, Ty and Chase earned their final punches last night and Jackson will probably work hard to earn his final 2 today. Know what else? 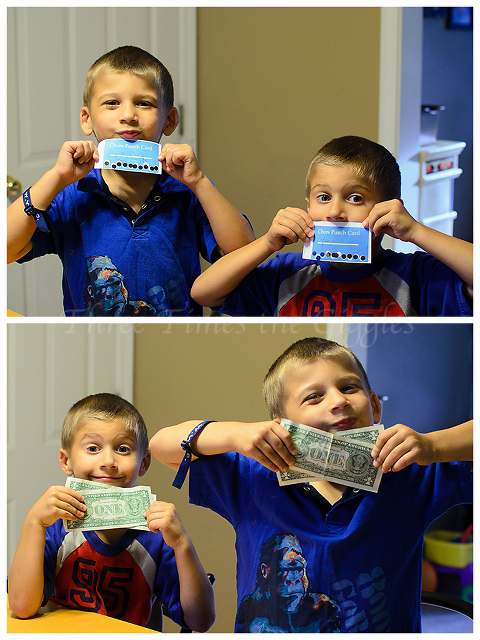 The boys are excited about having “real money” finally! Jackson is plotting to save up his to buy a Wii game, while Ty and Chase are already talking about when the ice cream truck might come by. 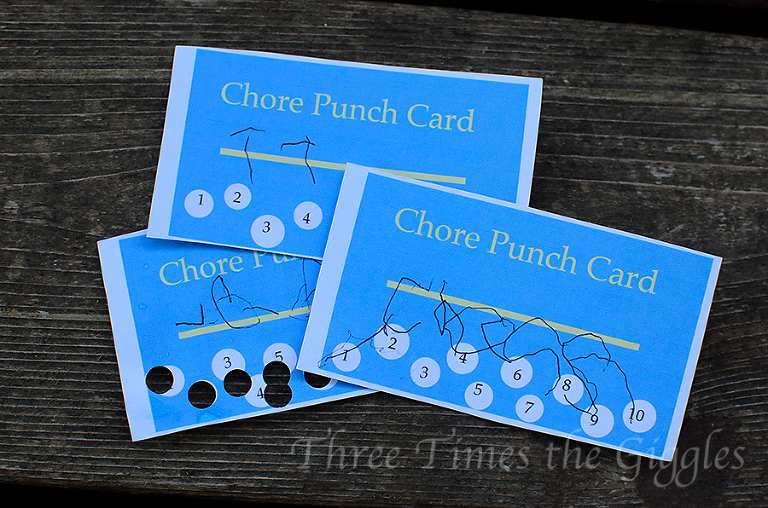 Want to do your own chore punch cards? Click here for a PDF of my cards, that you can download, print off and use in your home! That is a great idea! I may have to try some variation on it here. Just wanted to say thanks for sharing the .pdf file. I’m sure it saved me lots of time!! We’re starting tomorrow.. it’s going to be great!